I have found a major new pasta salad love. This is one of the most delicious things to grace my kitchen in months. For.real. First! 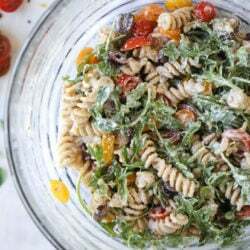 You guys know that I’m not a huge fan of pasta salad, especially creamy versions or other dishes filled with tons of dressing. I’ve never loved them and always pass over them at picnics and BBQs. Last year I made a crispy bacon pasta salad that SOLD me on pasta salads. I’ve just been waiting to make that for memorial day this year, but ummm… this salad right here might have taken over the number one spot. When the creaminess in a pasta salad is from goat cheese? Oh heck. I’m done. This is SO easy. So simple, with just a handful of ingredients. But it has such a ridiculous amount of flavor. It’s nuts! You have whole wheat pasta and immediately after it’s cooked, you drench it with some olive oil, lemon juice and lots of crumbled goat cheese. With a ladle of the starchy pasta water, you mix and stir it all together and it becomes this creamy, dreamy wonderland in a bowl. I.freaking.love.it. Then! It gets better. 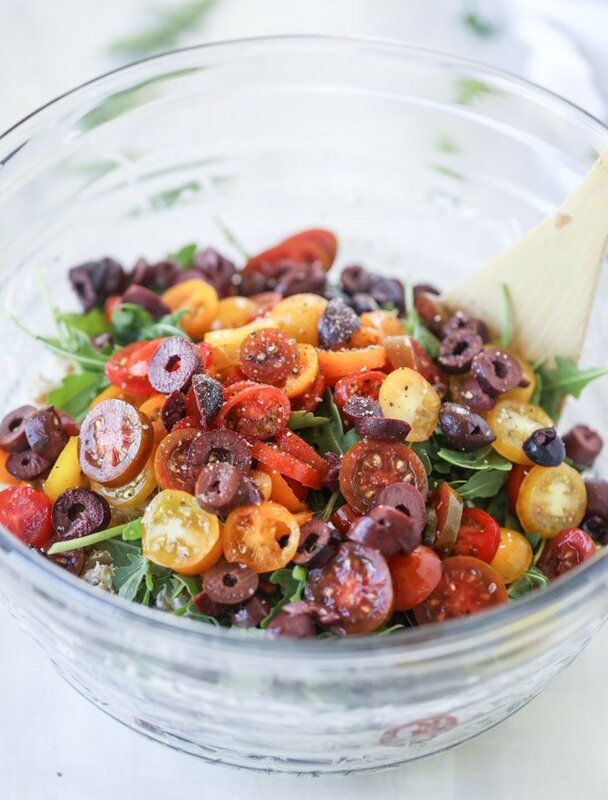 You stir in the arugula which slightly wilts and toss in some cherry tomatoes and kalamata olives. Holy flavor bomb! This recipe comes from Kathryn’s new and fabulous book, Love Real Food, which is out NOW! Yes yes, you can get your hands on this baby today. All of the recipes are vegetarian and for someone who isn’t over the moon about vegetables, I want to make allllll the recipes. They look mouth-watering. Lots of them are gluten free too! Her recipes are foolproof and just so FRESH. I adore them. If you have a similar palate to mine, i.e. that you adore goat cheese and briney olives and sweet tomatoes and peppery arugula (!!! ), you will flip over this. I like the idea of serving it at a BBQ or simmer picnic, but seriously, just having it for dinner is delicious too. I’d be fine with JUST this, but Eddie had it on the side with some chicken. Wowza. Also! Important. It reheats well too. Kathryn notes that after it’s store in the fridge, you can quickly heat it in the microwave just so the goat cheese becomes creamy again. That’s exactly what I did! Perfection. And even more flavor. Going to eat it forever and ever now. Bring a salted pot of water to a boil and cook the pasta until it’s al denta, according to the directions,. Before draining, reserve about 1 cup of the pasta water. Drain the pasta water and place it in a large serving bowl. Sprinkle the goat cheese over the pasta, then drizzle in the olive oil and lemon juice. Sprinkle in the salt, red pepper and black pepper over top. Pour about 1/3 cup of the pasta water over top and toss until the pasta is super creamy. Add the arugula, tomatoes and olives and toss to combine. If the pasta is too dry, drizzle in more of the pasta water and stir. You can also add in more olive oil if desired. Taste and season more if needed. Serve immediately. You can store this salad in the fridge for a few days – a quick reheating in the microwave will make the goat cheese creamy again! well, shoot. i had something completely different planned for dinner tonight…but THIS, oh my gosh is making me swoon. totally with you on olives + goat cheese + arugula. the flavor combo sounds insane!! you gotta try it jess!! It was a yummy dish! Okay, I’m not a pasta salad fan at all but this actually looks tempting. I think it may be going on my Memorial Day menu. you must try it girl! it’s SO GOOD. it’s basically like eating warm pasta with arugula mixed in, haha. so is this served warm? usually I identify pasta salads as cold, but seems like this would be warm or room temp for the goat cheese to stay creamy and coated? you are so welcome! we love the book so much! Those heirloom tomatoes look SO good! Plus goat cheese? I die. Can this be served cold? How will it taste? it can, it just won’t be as creamy! i suggest trying to serve it after making it (and it will stay creamy for awhile as it sits) – if you take it right out of the fridge, you might want to warm it up a little bit so the goat cheese gets creamy again! Hi this recipe is every ingredient I love in life! haha Do you know the nutrition facts and serving size for the nutrition facts? As a lover of saucy pasta, I was a bit skeptical. However, I made this tonight to rave reviews! It was delicious and I am eager for my leftovers tomorrow. The sauce was so creamy and the olive oil and lemon were perfect with the goat cheese.